Home » » #TickTock4: Attend An Advance Screening of Catching Fire! 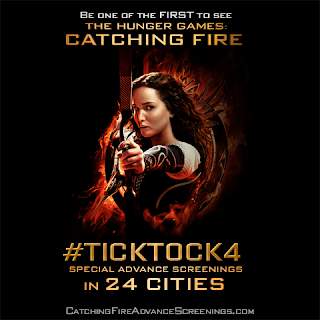 #TickTock4: Attend An Advance Screening of Catching Fire! In partnership with Subway, Lionsgate are holding advance screenings for Catching Fire in 24 different cities across the USA. Attendees will be amongst the first to see the film. The screenings will be happening on November 18th at 6:30PM PT. The full list of all 24 cities are now revealed on Facebook. Head over to the app to enter for your chance to attend a screening closest to you! Yahoo will be streaming the LA premiere live for all to see, beginning at 9:30PM ET. Attendees at the advance screenings will also be able to watch the event LIVE on the big screen!